I usually use foundations from Sephora, but a few of my friends used this foundation and they loved it. So recently, I went and bought a tube for myself. The color matched perfectly (ivory) and considering I have extremely oily skin, I was excited to see if it kept me matte. The foundation itself looked great and stayed on the amount of time I expected a drugstore foundation to stay on, but the pr...read moreoblem came when I removed the makeup. My skin is usually pretty smooth. I take good care of my skin, but still struggle with acne on my chin/cheeks. When I removed the makeup, all of the pores below my nose were completely clogged. It felt like I still had makeup on over extremely dry skin, but instead of just a dry patch of skin, it was like my entire face had changed texture. I washed my face three time and exfoliated, but it didn't get any better. It's been almost a week since I've used this foundation and my skin is still not back to normal. My color is True Ivory. I like it, I use my fingers and it blends beautifully. I use a moisturizer and primer underneath. The color is perfect and it does not feel heavy or look like I am wearing too much foundation. It does not magnify my lines or pores. Unless this starts to break me out, I will stay with this foundation. I am 56 years old, with a bit of acne scarring and this foundation does a great job of covering it. 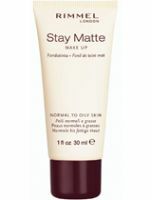 Stay Matte really is matte! I bought this from Walgreens since it was 50% (along with tons of other Rimmel products!). After trial and error, I found I'm their third shade, aptly named Ivory. The coverage on this foundation is amazing. It's very smooth, and goes on so cleanly. My skin is a dry combination, so I was worried this would cling to the dry patches. If you use a moisturizer and a primer before, it doesn't. Staying...read more power is great. It lasted all day long without me getting oily or itchy- which is super great. The only thing that's bad about this is that you should probably couple it with the stay matte powder or the finish can look awkward. Overall, though? It's my go-to and I've already bought another tube of it. For $6? It's one of the best foundations I've ever used. 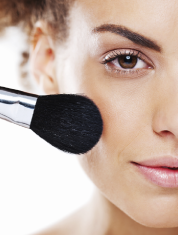 It's beat when applied with your fingers or a brush, then buffed in. Just definitely be sure to use a primer!